May 2013 – In the business of printing newspapers, it’s easy to get caught up in the frantic pace of deadlines and physical production. Having a daily or weekly product ready for delivery, with accurate information, printed on quality newsprint, and out the door on time, is a top priority. But some newspapers are proving that award-winning design can be part of that equation as well. The Society for News Design recently announced the winners of its 34th annual newspaper design contest, with 727 awards given in 19 categories out of more than 9,000 entries. 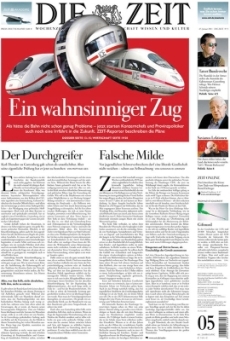 Five titles received the top honor of World’s Best-Designed newspaper: Die Zeit of Hamburg, Germany; Welt am Sonntag of Berlin, Germany; Dagens Nyheter of Stockholm, Sweden; Politiken of Copenhagen, Denmark; and The Grid of Toronto, Canada. The winners were honored for their top-notch design and print quality, in addition to excellence in the numerous other factors that go into producing a great newspaper. A big part of the criteria, in fact, was that design had to be backed up by production quality, which was a great thing to see. The best design in the world won’t look good if it’s not supported by a production team as dedicated to the finished product as the editors and publishers are. Print quality, from prepress to printing to postpress, essentially got out of the way in the case of each of the winning pieces. Judges — and readers — were never distracted from the quality of the articles or the design, and that is really what a good print process should do. Excellent production value disappears, so only the content catches the attention of the person holding the paper.